Overall, a good phone from Motorola. I wish the processor could have been better at this price range. It&apos;s enough for a casual user like me who wants to browse, watch YouTube and create something. But if you are a gamer, look for another phone. So, Motorola recently launched their next budget smartphone which goes by the name of Moto G6. The smartphone looks pretty amazing thanks to the glass back which literally feels premium for this price. The smartphone comes with a FullVision display and dual camera at the back. Although, camera might have been improved but I&apos;m hoping future updates will fix that. It comes with turbocharging which is great for those who&apos;re always in hurry. 2 Pricebaba users have written their experience with Motorola G6 64GB. 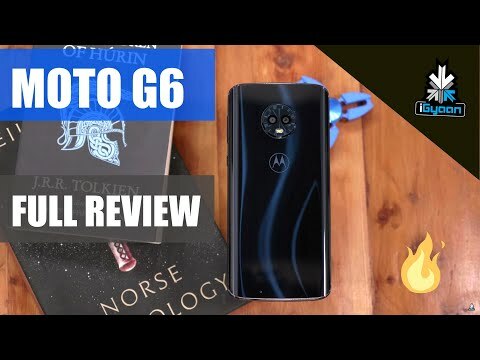 If you own Motorola G6 64GB, please do leave your feedback too. Lowest price of Motorola G6 64GB price in India starts at Rs. 9,968 Prices updated on 21st April 2019. Launched in April 2018, the Moto G6 for its novel design and an eye-catching tall display. This budget phone has a premium look and feel to it. Here is a look at its key features and specs. The Moto G6 64 GB is a sleek device, just 8.3 mm thick and weighing a mere 167 grams. The Moto G6 64 GB features a 5.7-inch IPS LCD screen with a screen resolution of 1080x2160 pixels, a pixel density of 424 PPI and a tall display ratio of 18:9. This Motorola device sports a 12MP dual real camera that comes with features like autofocus, auto flash, digital zoom, face detection and touch to focus, along with modes such as continuous shooting, High Dynamic Range (HDR) and portrait mode, resulting in highly vivid still shots and videos. The 16 MP front snapper offers clear selfies. With a Snapdragon 450 chipset and 4 GB RAM under its hood, the Moto G6 64 GB also sports an Adreno 506 GPU. The device has 64 GB of internal storage, expandable up to 256 GB. The 3,000 mAh Li-ion battery does leave something to be desired in terms of runtime, which makes the turbocharging support a welcome addition. On the connectivity front, the Moto G6 64 GB has WiFi, mobile hotspot, Bluetooth, USB Type-C, GPS, 4G and dual-SIM support. The Moto G6 is an Android device and runs v8.0 Oreo of the operating system.